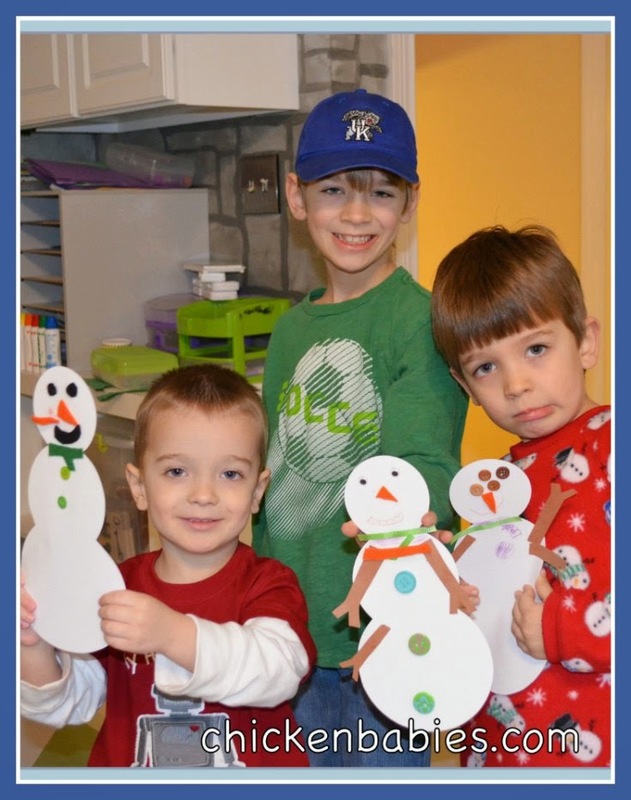 In December, I pinned a "Roll a Snowman" game from the blog Somewhat Simple. If you look at it, you will see she suggests you roll a die to get your snowman parts and whoever gets all their snowman parts first is the winner. The rules also say that if you roll a part you already have, your turn is over and it goes to the next player. I thought, "Well, that's silly. Why not just grab another of the same part? The kids would think that was funny." So, that's what we did. We had lots of fun creating our monster snowmen. I started by making large dice out of some cube blocks by adding pieces of paper with the snowman body parts on them: 1 button, 1 eye, 1 scarf, 1 nose, 1 arm, 1 mouth. I used 2 dice so our snowmen would build up more quickly. I had the same things on each die, but if I were to do this again, I would take out the scarf on one and replace it with a button, because it got hard to keep adding scarfs (I think Joshua ended up with 4) and the boys wanted to add more buttons. I brought out some craft supplies - bits of felt , ribbon , Buttons , googly eyes , colored pencils , construction paper and glue - for the boys to choose from. I gave each boy a large snowman body and we started to play. The rules were simple. Whatever you rolled, you added to your snowman. Whoever was the first to have at least all the parts in a normal snowman (which we decided was 2 eyes, 1 nose, 1 mouth, 2 arms, 1 scarf and 3 buttons) was the winner. But if you already had enough of a certain part, you could just add more, thus creating your own unique monster snowman. And while for Joshua this was not an incredibly educational activity, it was a good chance to talk about math with the younger ones. "You have 2 arms and now you're adding one more. How many arms will your snowman have?" etc... We also talked about what our snowmen could do with their extra body parts. I commented that my snowman must be able to smell things that are really far away with his 4 noses. Joshua commented that his snowman would have an advantage playing dodgeball with his 3 arms. 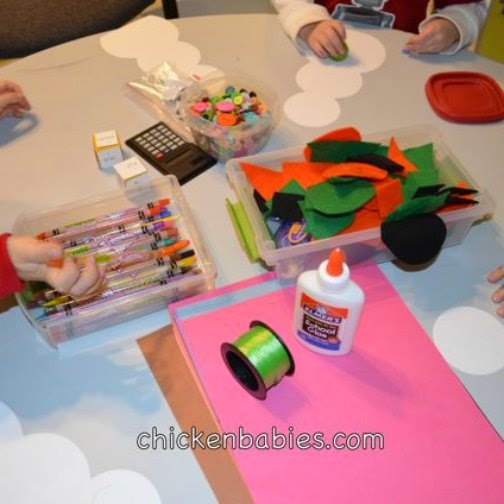 The boys loved this open ended crafting activity. There was no set description of what their snowman had to look like, they could use whatever materials they wanted, and it sure was funny when mommy kept rolling noses and ended up with 4 carrot noses on her snowman. And then there was the time mommy rolled and got eyes on both dice when she already had 3 eyes on her snowman. Oh boy. Nothing is more fun than laughing at your mother's misfortune during a game. This was a great art activity for our homeschool day, and I'm sure we'll be doing it, or something similar, again. This is so clever and cute. I love it! Thanks so much! Thanks for stopping by. Those are so awesome! I would love if you would share on Inspired Weekends, open Fridays through Thursdays! Will do. Thanks for the invite. What an adorable activity. I bet the younger ones really got a fun math lesson out of the whole thing. Perfect for winter! Pinning now. Very cute! I'm pinning this for next year when my sweet baby girl will be a little older. Love this and your other snowman activity - the snow just came here in London so we are going to have great fun trying these out. Also loving all your party posts - have just started a "Party Party" link-up http://mumsmakelists.blogspot.co.uk/2013/01/party-planner.html and would love to see your party posts on it. Thanks for stopping by and for the invite! I will come check it out. Popping by from I Can Teach My Child's Saturday link up. 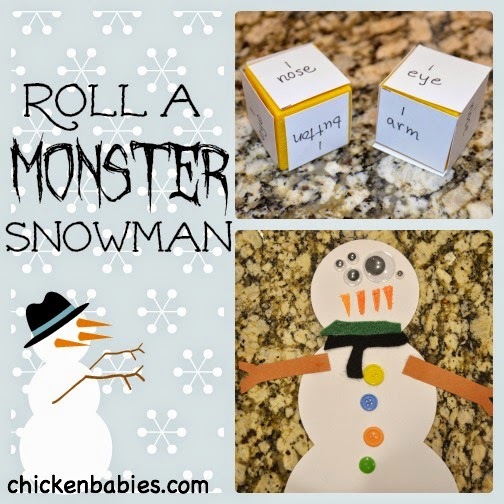 LOVE the idea of the roll-a-snowman. My kiddo and I will need to try this out soon. Thanks for sharing this idea. That is so cute...I will have to do this with my boys. Thanks for sharing! Oh my I love the "Game" element of this craft. Brilliant fun. Awesome! So glad it inspired you and extra glad you stopped by to let me know! Makes me feel happy.